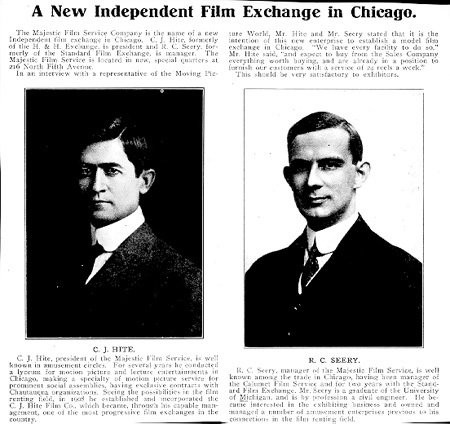 News article (L) from The Moving Picture World issue of January 10, 1912, telling of the formation of a new film exchange in Chicago. Thanhouser Career Synopsis: Charles J. Hite was president and chief executive officer of the Thanhouser Film Corporation from spring 1912 until his death in August 1914. Biographical Notes: Charles Jackson Hite was born on June 7, 1876 in Pleasantville, near Lancaster, Ohio, the son of Mr. and Mrs. Lemuel Hite, and was one of 10 brothers and sisters. His father, Joseph Lemuel Hite, was born in Pleasantville on October 25, 1842, and his father before him, Joseph Hite, was born in the same township on October 24, 1811, of parents who had come to Ohio from Rockingham County, Virginia around 1806. The Hite family expanded to the extent that by the late 19th century, dozens of citizens of Pleasantville Township had that surname. Hite's Early Life: Motography, September 28, 1912, told of Charles J. Hite's early life: "The first thrill of a country lad comes with his red-topped boots. It is the day he discovers his spine. He sees things from a course. When motion pictures began to manifest themselves, this boy who was born in the country had an edge on the fella who wasn't. He knows what it means to earn a dollar. He got his first one by digging twenty rows of potatoes. A dollar has the meaning of 100 cents to the man who was a country boy 25 years ago. The same boy never forgot his early associates. He learned to take their measure and he never forgot how he did it. When he grew up he made his estimate of men by the same rule. "Charlie Hite was born in the country - on a farm near Lancaster, Ohio. His family sprung from those fighting Virginians, who helped in the forming of this country. They knew what Culpeper Minute Men stood for when they fought under the emblem of the rattlesnake. Virginians in those pioneer days picked out Fairfield County, Ohio, as the place 'farther West,' and among them were Charlie Hite's parents. The Hite family still retains the land that has always been their home. "Young Hite tackled the district school with his noonday lunch and a bean-shooter as the prime factor. He fell heir to 'Skinny,' because he was built that way. Even with this slight handicap, he learned to like school days, and followed up his graduation from the grades with a three years' academic course in the Ohio Central Normal College. Then he taught school for many years, and during his vacations he served as a reporter for the local papers. When he gave up teaching he engaged in the mercantile business at Bremen, Ohio, but the excitement attending the keeping of a country store got on his nerves and he gave it up. Hite put in four years behind the counter, first in Bremen then in the county seat of Fairfield County...."
Into Motion Pictures: The account in Motography continued: "During these and preceding years Charlie Hite developed a bug for lyceums, lyceumites, and bureaus, courses and causeways. Being of a bashful and retiring disposition he found freedom in the turmoil of the lyceum program. There was more fun in sitting on the back bench at the town hall and listening to the 'show' than there was going swimming with the gang. After time he worked up to the front seats, and a little later he became identified with the business end of the Midland Lyceum Bureau. He traveled in the Southern states, organizing lyceum courses at so much a course. When motion pictures began to manifest themselves, Hite had met them more than half way. With a half of one of his good bright eyes he saw a place for motion pictures in the lyceum programs. They would help with the entertainment. That was what they were for and he gave them a welcome. "In 1906, Charlie Hite organized himself into the C.J. Hite Moving Picture Company. He would supply the Midland or any other lyceum with part of their entertainment so much per part. He found lots of demand for his services. He rapidly outgrew the days when Bill Bryan was the afternoon stunt and Charlie Hite with his pictures was the evening attraction. In the meantime, Hite was garnering up film subjects and other increments that failed to shake off. His collection of reels consisted of scenics, fairy tales and religious subjects - the best that could be had in those days, and it was the most natural thing in the world for Hite to embark in the exchange business, as early as the demand for films came on. Early in 1908, C.J. Hite gathered up his precious reels and stored them in a vault in the Monadnock Building, Chicago. It was the least pretentious film exchange in the world. You could walk right into it - all the way up to Hite's mean little desk with the rickety drawers. But you would find the whole force there, day or night, and if you wanted some pictures, Hite would get them for you. He was the whole force on the day and night shift. There weren't any go-betweens. You know how long that would last today in the film business. "Hite got thinner and thinner. He had the address of his home, but he never got that far away from his little old desk. One day he called in the doctor - a physician he had known all his life - and the doctor looked him over. He listened to Hite's proposition and left a big, fat check instead of a prescription. Now and then you find a smart one. This was Dr. Wilbert Shallenberger, one of Charlie Hite's boyhood chums. He's all tangled up with the film business by now...." The story of the check in lieu of a prescription was repeatedly denied by Hite, but it became a part of film folklore and was repeated in many biographical accounts concerning him. The account in Motography continued: "This first Chicago film exchange was modest like its owner. It was called the C.J. Hite Company, just like that, telling nobody what it stood for. After little time a partition was knocked down to make room. The name was changed to H. & H. Film Service Company [when S.S. Hutchinson, who was later to achieve success with the American Film Manufacturing Company, joined him as a partner]. More people were hired; more money was let in; the place moved down a flight of stairs and across the hall; bang, what a lot of walls; the place strung out on the Federal Street side and got bigger and bigger. Hite was too busy to eat. Then Des Moines was taken in and Detroit was added, and people began to lose track. One day Hite grabbed some stock in the American Film Manufacturing Company, and next he bought the Globe, the Royal, and the Union film companies and formed the Majestic Film Exchange." The Thanhouser Acquisition: "After a while, Hite said he was going to New York to look around." the narrative in Motography continued. "He had only been down there a week or two until it was announced that he had bought the Thanhouser Company. Then things got all woozy. The plot thickened and obscured the stage. Since the mist has blown away, Hite's name looms large as a stockholder, a director or an officer; and sometimes all three, in these concerns: Mutual Film Corporation, the Film Supply Company of America, American Film Manufacturing Company, Carlton Motion Picture Laboratories, Majestic Manufacturing Company, Thanhouser Company, and Thanhouser Film Company, Ltd., London. "So you will agree that Charlie Hite has been hitting the pace. He is one of the very few film men who recognize the possibilities of outside investors. He is the personal representative of many stockholders in his various enterprises and these stockholders have learned to believe in Hite and his projects. It is a far cry from the Slayton and Midland lyceum circuits to the film game, but it proves that you can play both and win if you play fair. "Charles Jackson Hite is only 37 years old. He married Miss Gertrude Monroe, daughter of Dr. and Mrs. J.O. Monroe, in 1905, and there is little Elizabeth Marjorie Hite to complete the family. Hite says his only diversion is motion pictures, but that is pardonable. As a matter of truth he is a baseball fan - a Cub rooter who is trying to switch his affections to Mugsy MacGraw. His nearest friends say he is crazy about automobiles, now that he has several to help him cover ground in his activities. Right this minute, he is knitting his brow over Thanhouser classics, without regard to the length. Hite has only started. You will hear from him often, if you stick around." The Thanhouser Years: With the Shallenberger brothers (Wilbert E. and William Edgar), Crawford Livingston, and others as investors, Charles J. Hite joined founders John R. Freuler and Harry E. Aitken in the formation of the Mutual Film Corporation early in 1912. By acquisitions and internal growth, Mutual during the next several years became one of America's most important film manufacturers and distributors. Hite and his partners acquired the Thanhouser Company from Edwin Thanhouser for $250,000 on April 15, 1912, in a transaction arranged by Harry E. Aitken and other principals of the Mutual Film Corporation. Charles J. Hite was named as president of the company, which was recapitalized and renamed the Thanhouser Corporation. Edwin Thanhouser agreed to remain on hand as a supervisor and film director until the end of 1913. "You enter a wide hall, from which a massive stairway leads to the upper part of the house, and are impressed at once by the many noble canvases which meet the eye in every direction.... On the main floor there are, besides the hall, a drawing room, music room, salon, dining room, and morning room. The color scheme of most of these is a combination of green, gold, and old rose, with proportions in each differing slightly from those in the others, giving a variety to the effect, which is very pleasing to the eye. The general tone of the furnishing is the middle part of the 19th century, substantial, rich and comfortable. Chairs upholstered in tapestry, massive pedestals supporting busts and statuary, neatly designed cabinets, old-fashioned couches, and cozy window seats make a very inviting interior...."
Tuesday, March 31, 1914: "Charles J. Hite, president of The Thanhouser Film Corporation, has taken a three-year lease on the Francis Wilson house, Meadow Lane, and intends at the end of that time to purchase it, thus, making his home permanently in New Rochelle. Mr. Hite said today that he had his eye on the place for a long time, attracted by the beautiful grounds, the flowers and the view. The house cost the great comedian a small fortune to build and enlarge and alter from time to time. There is a theatre in it that will hold 600 people, and it has a fully equipped stage. Mr. Hite said he would have an opportunity to entertain largely in it. He is to move in about two weeks. Decorators are at work in the house. The house and grounds will be used for a large part of the location of The Million Dollar Mystery, which is to be featured all over the country shortly and which was announced recently by The Evening Standard. It will, it is said, be the largest business deal ever made in New Rochelle." April 1, 1914: "The lease of the Francis Wilson place, Meadow Lane, by Charles J. Hite, president of The Thanhouser Film Corporation announced yesterday in The Evening Standard, is one of the most important real estate operations that has taken place here in some time, for it has a significance beyond the mere fact that a property has been leased for three years with an agreement to purchase at the end of that time. It means that Mr. Hite, who is the head of one of the largest and most important motion picture concerns in the world, which maintains a large payroll, has finally decided to make New Rochelle his home. Many figure he intends to keep the film studios and plant here permanently for that reason." "The Wilson house, erected for the great comedian about 20 years ago, has been enlarged and improved since, and a large private theatre with a fully equipped stage has been added. There is, also, a large handsome garage. The property is situated on a high knoll overlooking Long Island Sound and has a fine view. The place is assessed at $34,800. If the assessment is on a basis of 60% of the value, it is worth at least $55,680. The price that Mr. Hite has agreed to pay is not given. Mr. Hite said yesterday to a representative of The Evening Standard that he would probably entertain in the private theatre as Mr. Wilson used to do when he had many of his actor and artist friends up from New York City and from New Rochelle and Larchmont to visit him. "During Mr. Wilson's residence here, his home was a treasure house of art and curios. He has a passion for fine and rare paintings and has spent thousands of dollars for them. Much of his collection was taken to his home, 24 Gramercy Park, New York City when he left New Rochelle and to his summer place in Lake Mahopac. Mr. Wilson and his family were long residents of New Rochelle and were very popular. He was a native of Philadelphia and in his time was one of the leading comedians on the American stage. His first engagement was in a minstrel company, but he soon went into legitimate comedy and later was a star in musical comedy. Then he surrounded himself with his own company and continued for many years until he returned to the legitimate drama under the management of Charles Frohman. Many New Rochelleans have seen and heard him and enjoyed his comedy. He is an author and a playwright and a member of the Players, Lambs and other clubs." Hite's Business Success: Hite was a gifted entrepreneur, and under his administration Thanhouser achieved many successes, building upon the foundation laid by the firm's founder. The first of two Thanhouser serials, The Million Dollar Mystery, released in 1914, was the most profitable serial issued by any motion picture company up to that time. In an article, "Fortunes of the Movies," in The Photoplay Magazine, October 1914, Charles J. Hite was among 12 millionaires listed. The others were Siegmund Lubin, Thomas A. Edison, Harry E. Aitken, Marcus Loew, G. M. Anderson, Adolph Zukor, George K. Spoor, Aaron J. Jones, Carl Laemmle, William N. Selig, and Jesse E. Lasky. Like Edwin Thanhouser, Charles J. Hite was widely respected by others in the trade and was admired by his employees, many of whom in later years stated that working for the Thanhouser Film Corporation was the most enjoyable time of their careers. Hite was very much a family man, and numerous press notices told of his children. The following account appeared in The Photoplay Magazine, December 1913: "Muriel Josephine Hite, the three-months-old daughter of President Hite of the Thanhouser Company, continues to grow rapidly, both in beauty and intelligence. Mr. Hite declares he walked into the nursery the other day and Muriel Josephine was singing When It's Apple Blossom Time in Normandie to her older sister, Margaret, age five years. Mr. Hite says he just tiptoed right out, because he felt sure it was no place for him while his daughters were rehearsing their duet. Some baby, eh?" Apart from Thanhouser Film Corporation activities, Hite was involved in other New Rochelle business and civic affairs. In December 1913, he offered the Volunteer Copy Crew, a group of young men from ages 14 to 20 who were training as firemen, the use of a garage at North and Fifth avenues to store equipment, according to an article in The New Rochelle Pioneer. December 6, 1913. The same publication, under the date of March 21, 1914, told of a corporation to be capitalized at $300,000, to be called the Mr. and Mrs. Vernon Castle Academy, a "palace of the dance," to be erected at the corner of North and Lockwood Avenues in New Rochelle and to be the largest dancing school in the United States. It was to have a pipe organ costing $10,000 and was to be financed with gold bonds and preferred stock. "Charles J. Hite, of Rochelle Heights, has been offered the presidency and when he decides, the names of the officers will be made public." 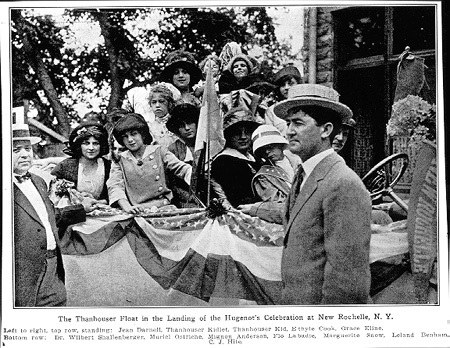 Hite and his company contributed to many civic causes and organizations, and of all institutions within New Rochelle, the Thanhouser Film Corporation was one of the most admired. The Final Curtain: On Friday, August 21, 1914, Charles J. Hite, having just returned from a meeting with financial interests in Chicago, was busy in New York City with arrangements concerning the Broadway Rose Gardens, which was being remodeled and was considerably behind schedule for its planned opening. On that particular afternoon he was previewing a special "daylight" movie screen which had just been installed. He worked late, had a quick evening meal with J.W. Chase, a broker of New York and Chicago (some accounts say he skipped the evening meal), then jumped in his car and headed northward, for he was to host an evening affair. Thanhouser actress Muriel Ostriche recalled: "The Thanhouser players had gathered at a restaurant in Westchester County, where a big affair was being put on by a soda water company called Clysmic Waters. Charles Hite had an interest in that, and at one time I was going to buy some stock, but I didn't. Things could not start until Mr. Hite arrived, and we kept waiting and waiting. Finally, we learned that he had been in an accident, and I went with James Cruze and my mother down to the hospital...."
The New York Times, August 22, 1914, continued the story: "Charles J. Hite, president of the Thanhouser Film Company, was on the way to his home in New Rochelle last night and was crossing the viaduct at 155th Street at 9 o'clock when his automobile, in which he was driving alone, skidded and ran onto the south sidewalk, tore through the iron rail at the side of the walk, and dropped fifty feet to the ground beneath. The machine landed on the fifteen-foot wooden fence on the 155th Street side of the Central Casino, which fronts on Macomb's Place, and tore through it, at the same time turning until it landed, wheels up, on the sidewalk with Mr. Hite pinned beneath it. "Patrolman Waters of the Lenox Avenue station, who was on the viaduct when the auto fell, ran down the steps and summoned aid. There was a dance in the Central Casino, and the sound of the crash as the auto hit the fence brought the music to a stop and the dancers to the street. It took fifteen minutes to get Mr. Hite from beneath the motor. Then he was taken to the Harlem Hospital by Dr. DePalma. In the ambulance he recovered consciousness and asked that his wife in New Rochelle should be notified of the accident. He had suffered a fractured skull, a compound fracture of the jaw, a cut on his right arm, and three broken ribs. It was said he would die." Additional details were given in The Bioscope, September 10, 1914: "He was crossing the viaduct over 155th Street, connecting Amsterdam Avenue and Central Bridge. There is a slight turn in the viaduct about 150 feet from Amsterdam Avenue. As he heard this he saw a street car approaching, jammed on his brakes, and attempted to turn aside. According to witnesses, the brakes either refused to work or the car skidded in the slippery roadway. He probably could have passed the car safely, but at that moment, according to witnesses, he saw a little girl standing in the roadway waiting for the car to pass before crossing the street. "Mr. Hite gave the steering wheel another twist and shot straight for the sidewalk. The car zig-zagged until it bounded over the curb. Mr. Hite attempted to leap out of the car, but was prevented by the high steel windshield, and was in the car when it crashed through the flimsy iron railing of the bridge as though the railing were made of scenery, and took his final leap over the side to the street 50 feet below. The car turned a complete somersault before it landed right side up on the ground, carrying with it in its fall a large section of a high board fence surrounding an amusement park. The crash was heard by diners in a restaurant near by, and after some seconds, during which the spectators were almost paralyzed with horror, there was a rush of people to the spot...."
The Moving Picture World, September 4, 1914, told more: "Charles J. Hite, president of the Thanhouser Film Corporation, died on the morning of Saturday, August 22, in the Harlem Hospital as a result of injuries received the evening before when the high-powered car he was driving crashed through a fence at the corner of 155 Street and Central Bridge. He is survived by a widow and two children. "Mr. Hite was alone in the machine, which he had owned about a month. There had been an unusually heavy rain on Friday afternoon, and the pavement was still wet. The accounts of the accident varied, but when aid reached Mr. Hite as he lay under the machine 40 feet below the street level he said something to the effect that the brakes would not stop the car. He was, too, able to give his name and address. He lost consciousness when with the aid of a jack from the nearby elevated shops the automobile was raised so he could be lifted out. Mr. Hite was at once removed to the Harlem Hospital, where it was found that he had suffered a fracture of the skull, compound fracture of the jaw, fracture of the left ribs, and internal injuries. "Central Bridge is to 155 Street as the cross on a capital T. Coming toward the bridge there is a sharp decline. Mr. Hite naturally would have turned to the left, but his car plunged through the stout fence on the right hand side, plainly with great force. It was said by an eye-witness that he had tried to avoid hitting a pedestrian who had blocked his path. Another person said that he had gone through the fence with his car reversed. What is probable, however, is that the machine skidded and the brakes failed to hold. "Charles J. Hite was born 39 years ago in Ohio.... His first work was on a farm in Lancaster. After a course in the district school he spent three years in the Ohio Central Normal College. Then for a time he taught school. His first commercial venture was in a lyceum film exchange in which he supplied films to the Ridpath Lecture Bureau. Then with S.S. Hutchinson, now president of the American Film Manufacturing Company, Mr. Hite opened a small film exchange in Chicago, which was given the name H & H. The combined capital was $1,200, but the partners divided $10,000 the first year - 1909. Harry Aitken, now president of the Mutual Film Corporation, at that time was conducting the Western Film Exchange in Milwaukee. He joined Mr. Hite and Mr. Hutchinson in organizing the American Company. On account of the opposition to the admission of the Majestic to the Sales Company the partners conceived the idea of acquiring exchanges of their own. The result is the Mutual Film Corporation. He was president of the Broadway Rose Gardens.... He was the organizer of the Syndicate Film Corporation.... He was also interested in the Bangs Laboratory and had in charge the exploitation of the pictures taken by the Williamson submarine expedition. It is announced that there will be a meeting of the stockholders of the Thanhouser Film Corporation on September 1 at which time the successor of Mr. Hite will be elected...."
Another Account: A lengthy account of the accident, in the New Rochelle Evening Standard, August 22, 1914, included this information: "There is so much work to be done at the studio, this city, that Miss Jessie R. Bishop, secretary of the corporation, gave orders that the work should go on as usual because she knew that Mr. Hite would have wished it. But the work was only half hearted for the most part and nothing important was attempted. The efforts of the directors could not dispel the gloom that pervaded the place. "[After the accident] he was lifted from the automobile and laid on the sidewalk. He asked [the first people on the scene] to telephone his wife if he should be taken to the hospital. The he became unconscious. An ambulance with Dr. DePalma took the injured man to the Harlem Hospital. He regained consciousness in the ambulance, but relapsed again before reaching the hospital and remained in that condition until he died. It was said that Mr. Hite's skull was probably fractured at or near the base, his jaw was broken in 14 places, his spine was wrenched seriously, and he probably had internal injuries. Besides these, his right collarbone was shattered and he had a deep gash in his left thigh which extended to the bone. "Mrs. Hite and Miss Bishop were notified and they hurried to the hospital and were taken at once to the private ward in which Mr. Hite had been placed. He was unconscious. The house surgeons who had made a superficial examination held out no hope for his recovery and announced that death was only a few hours off. Mrs. Hite sent for Dr. Gibson, a specialist of New York City and Mr. Hite's own physician, Dr. Henry W. Titus, this city, who arrived shortly after in their automobiles, and remained with him until the end. "Mr. Hite was the son of Mr. and Mrs. Lemuel Hite, who are living at his birthplace, Pleasantville, Ohio. He was born on June 7, 1876 and was one of 10 brothers and sisters. His father was a farmer, and young Hite was brought up in agricultural surroundings until he became a country school teacher. Even then, when there was no school he worked on his father's farm. Later he entered the newspaper field and became a reporter writing for Ohio newspapers. This was followed by four years in mercantile life as a dry goods merchant in Bremen, Ohio. At the end of that time, he became connected with the Midland Lyceum Bureau, and was manager for some time.... [Then followed an account of his career, culminating with his activities with Thanhouser and Mutual.] Recently, he leased the Francis Wilson Residence, Meadow Lane, for a term of years, intending to purchase it. It is one of the finest homes in New Rochelle and Mr. Hite wanted it for his family and the entertainment of his friends.... Mr. Hite was greatly beloved by his employees because of his consideration and kindness, and because he always had a smile and a pleasant word for them. He treated each one as a friend. 'When it came to a showdown,' said Miss Bishop today, 'there never was a man more just or a man with keener feeling or keener sympathy. He believed in people.'" New Rochelle Mourns: The New Rochelle Pioneer, August 29, 1914, gave more details of Hite's death: "While on his way to his home in this city last Friday evening, Charles J. Hite, president of the well known moving picture concern in this city, The Thanhouser Film Corporation, met with an accident at the viaduct over 155th Street, New York City, sustaining injuries from which he died in the Harlem Hospital early Saturday morning. From what can be ascertained the machine in which Mr. Hite was riding was a high powered one, and from the evidence of eyewitnesses of the terrible accident, he was evidently endeavoring to escape running over a child, when from some cause the machine skidded. Perceiving his perilous position Mr. Hite attempted to get out of the car before it crashed through the iron fence, but he did not succeed, and went down with the car. "The machine, its steering gear apparently deranged, smashed into the four-foot railing along the bridge and cut through it as though it were paper. Eight feet of the railing was torn away. The machine fell into the grounds of the Manhattan Casino, its rear being tilted against a 15-foot fence separating the Manhattan's summer garden from that of the Central Casino. The accident was seen by Robert Walters, of No. 304 West 147th Street, and the crash through the railing was heard to the further end of the viaduct. The car was literally broken to pieces. Hite was so tangled in the wreckage it was difficult to get him out. "G.T. Renke, of Kingsbridge Road, who saw the accident, said Hite made a quick turn of his car to avoid running over a child that got off a Bronx car, and the automobile skidded and plunged over the bridge. The crash was heard by persons dining in the amusement casino, who looked up to see the vehicle make a complete revolution in the air and strike a fence 15 feet high which surrounds the Casino gardens. Those who witnessed the accident seemed paralyzed with horror, for no attempt was made to reach Mr. Hite until Howard Duncan, a chauffeur, of No. 267 West 153rd Street, and Edward Fruidiger, of No. 304 West 152nd Street, hastened from the viaduct down nearby stairs and began a search for him. [Robert Walter, of 304 West 147th Street, was also on the scene early.] He lay crumbled within the steel windshield which had prevented his escape before the roadster left the viaduct. To their surprise they heard him speaking. "There was no chance from the first for the unfortunate man's life, as his injuries were too serious. His skull was fractured, both legs broken, collarbone broken besides being hurt internally. His jaw was broken in seven places but despite this he was able to articulate plainly enough to make his last wishes known. [Sergeant Doherty, of the Lenox Avenue Station, called an ambulance, and Dr. DePalma, of the Harlem Hospital, responded.] His first thought after the accident was of his family and actor friends at the Thanhouser studio. He asked the hospital attaches to send for his wife. The latter hurried to the hospital, arriving there about midnight. "Mr. Hite came to New York three years ago. Two weeks after he arrived here it was announced that he had secured not only the control but practically all of the stock of the Thanhouser Film Corporation in New Rochelle. He is credited with having made a big fortune in seven years. He leaves a wife and two children. Besides his parents, wife and two young children, Mr. Hite is survived by three sisters, two of them unmarried, who live in Lancaster, and Mrs. W. Ray Johnson, this city, wife of Mr. Hite's private secretary, and four brothers, Claude, Leo, Joseph and Guy. "The funeral services, which were held at his late home Tuesday afternoon were attended by over 400 persons, among whom were officers, directors and employees of the Thanhouser Film Corporation officers and directors of other motion picture companies, actors and actresses, and personal friends, neighbors and acquaintances. The beautiful service for the dead of the Episcopal Church was performed by the Rev. August Ulmer, rector of St. John's Church, Wilmot, and who is acting as assistant to Rev. Charles F. Canedy, rector of Trinity Church, who is absent on his vacation, who conducted the services from the lower step of the main stairway in the large reception hall. Miss Alice McCardell, daughter of Mr. and Mrs. Roy McCardell, rendered very effectively two violin solos accompanied by Robert Roese. They were Asa's Death, by Grieg, and Ave Maria, by Shubert. The casket was almost hidden from view in the back parlor by the mass of floral emblems, conspicuous among which was that of a large proscenium arch of asters, roses and lilies of the valley, containing 2,000 asters alone. The piece represented a lowered curtain with footlights dimmed, and across the curtain on a strip of film: 'The Last Act.' This was from the Thanhouser laboratory employees. "At the conclusion of the services and just before the remains were taken from the house, Rev. Ulmer stepped in front of the casket and made a silent prayer, the solemnity of which was deeply felt by every one present. As the remains were being carried to the receiving vault in Beechwood Cemetery, the hundreds of floral pieces had been placed in a semi-circle about the entrance to the vault, and as the funeral procession passed toward the vault it was a most impressive and beautiful sight, the white doorway of the vault showing out in bold contrast to the variegated flowers. As the remains were placed in the vault Rev. Ulmer said a prayer...."
"To know Mr. Hite was to love him. To some he seemed unapproachable; to others his latch string was always out. He was always occupied with big thoughts, yet he found time to fraternize. He loved his family, and idolized his two daughters, whose likeness is shown in another column for the first time in any newspaper. It is a sad taking off that will leave its sting wherever Mr. Hite was known. His friends knew how he aided many a struggling writer or actor after he had started the climb that brought him to the top round of the ladder, and New Rochelleans know how he had aided many families where his hand was hidden. Everybody knows how he rose, phoenix-like from the ashes of the old Thanhouser studio fire where he lost $85,000 and inside of a year erected a monument to his energy that bids fair never to crumble away. He had bigger things in store for New Rochelle that his sudden demise may not stop, because he wished Thanhouser and New Rochelle alike to be known wherever his output went, and it was shown from Florida to the Canadian border and from where east meets west. "Next Tuesday was to be the day when Mr. Hite was to publicly divulge his plans to make the Thanhouser studio the biggest in the world, and it is said that no change will be made in these plans. The new concern was to increase from $400,000 to $1,000,000, and to some people close to his confidence, he talked of an ultimate $10,000,000 enterprise. It took a mind the size of the one possessed by Mr. Hite to conceive the possibilities of The Million Dollar Mystery, and it took him just seven minutes to decide whether or not to handle it. More than a half million dollars were involved before the output would reach the screen, but at that he did not blanch. He was a man of few words, and when he gave the signal to start, the author, Harold MacGrath, was hundreds of miles away from civilization. 'Get him!' was Mr. Hite's simple order. And, though the search led through jungles, MacGrath was brought, eventually, to New Rochelle. The Francis Wilson house of mystery on Meadow Lane was secured under a lease at a price that would make others pause. Not so with the brains of the Mutual service. The place was secured. And Lloyd F. Lonergan, the conceded-to-be greatest scenario writer in the world, was put at work with Mr. MacGrath and together they created the marvel serial that has caused the film world to gasp in wonderment. Then Mr. Hite planned the publicity end, with the result that the story is appearing in 200 metropolitan daily newspapers in the United States and Canada, and the advertising figures reached to enormous proportions. And the success of the series shows that Mr. Hite knew what he was doing. "His life should prove a great incentive to American youth because it shows what application can do. Seven years ago Mr. Hite began to handle film in a small way, and by steadily forging ahead came to the top of the film world and never forgot his democracy through it all. He was a natural organizer. He could instantly grasp situations and visualize their shape insofar as they affected him. It is said of him that he never made a mistake in judgment, and his work bears it out. The Pioneer extends to his family in this, their darkest hour, its sympathy, and hopes that fortitude will strengthen and the burden of grief be made lighter in the thought that rather than sacrifice life he gave his own that others might live." Final Arrangements: Charles J. Hite was survived by his wife and two daughters, Marjorie, age four, and Muriel Alice Josephine, age one; by his parents, who lived in Lancaster, Ohio; four brothers: Claude, Leo, Joseph, and Guy; two unmarried sisters who lived in Lancaster, and another sister, Violet, who was the wife of W. Ray Johnston, a Thanhouser executive. One sister married Grover Baluser, of Ohio, and named her infant daughter Zudora, from the Thanhouser serial of that name. Following the funeral services, his body was taken to Beechwood Cemetery. Nearly a year later, in its issue of June 15, 1915, The New Rochelle Paragraph noted that his remains were removed from that location and interred in Oakwood Cemetery, Chicago, by order of his widow. The New Rochelle Pioneer, September 5, 1914, carried this item: "The will of Charles J. Hite, of this city, was filed at White Plains, Wednesday afternoon, for probate, and it is one of the most peculiar wills ever filed in this county. He made no bequests, and the estate will be divided as though he died intestate. Mr. Hite was president of the Thanhouser Film Corporation and was killed when his automobile went over an embankment in the Bronx, on August 22. He died the following day. He leaves no real estate, but in the affidavit it is said that his personal property is over $50,000. He was one of the first big men to see the profit in motion pictures and he has made a large fortune out of the industry. It is estimated that he left about $300,000. He makes a provision in the will which names Wilbert Shallenberger as executor. He lives in Waterloo, Iowa, and refused to serve in that capacity, Addison E. Jones, of New York, was named executor in case Shallenberger refused to serve. The will was drawn on July 15, 1913. No mention is made in the will of Gertrude Hite, his wife, or Elizabeth or Muriel Hite, his daughters." The same newspaper, under the date of October 3, 1914, printed a report concerning the Surrogates' Court: "Will of Charles J. Hite, late of New Rochelle; executors named in will renounced as such. Personal estate $50,000. Cravath and Henderson, attorneys for estate, 52 William Street, New York City." The New Rochelle Evening Standard, November 17, 1916, printed this item: "Charles J. Hite, late president of the Thanhouser Film Company left an estate appraised at $446,816.96, according to the report filed by tax appraiser William C. Clark. All the wealth is personal property. The deceased owned no real estate. Mr. Hite came to his untimely death when his automobile plunged from a precipice while he was returning to New Rochelle on August 22, 1915. The accident occurred in the Bronx. At the time of his death Mr. Hite was on the top rung of the ladder of fame. He had made a fortune with The Million Dollar Mystery for himself and stockholders and was commencing Zudora which he figured would be the second type Mystery success. After his death the picture proved to be a great failure." More was printed in the November 18th issue of the same newspaper: "When G. Henry Mahlstedt, attorney for transfer appraiser, William C. Clark, was asked the cause for the two year's delay in establishing the value of the estate of Charles J. Hite, former president of Thanhouser Film Corporation, he said: 'Mr. Hite's investments in the moving picture industry were so numerous and complicated that for a time it looked as if the estate of the deceased moving picture man would not come up to his restriction amount of $15,000, $5,000 each for his wife and two daughters. It took Paul H. Davis, of New Rochelle, one of the executors, two years to straighten out the estate. However after the estate was straightened out it was very evident that if Mr. Hite had lived he would have been the most influential as well as the wealthiest man in the industry. Many of the prospering movie picture concerns in which he and Arthur [sic] E. Shallenberger, vice president of the Thanhouser Company, held controlling interests commenced to wane at the death of Mr. Hite. Mr. Hite's will was one of the most peculiar documents I ever saw. Knowing very well that if he failed to name legatees the estate would go to his wife and children, Mr. Hite drew up a will directing how his estate should be managed but failed to name persons to whom he wanted to leave his estate. The estate went to his wife who now lives with the two children at Chicago I believe.'" Tributes: Bert Adler, long-time publicity director for Thanhouser, and in recent times a special assistant to Charles J. Hite, wrote the following tribute, which appeared in The Moving Picture World, September 4, 1914: "C.J. HITE, THE MAN. The death of C.J. Hite was typical of the man - quick. None of us at the Thanhouser studio ever saw a man who got to the core of things with the lightning quickness of C.J. Hite, or who could accomplish so many tasks within short spaces of time. He was always on the rush, of necessity. But even after business he would rush! Rush! Take his fun quick in his speedboat or fast car. I know of at least one man who won him because he reflected Mr. Hite's own trait of moving fast. This man also won a plum for which many had been striving. It was the European agency for the Thanhouser films. When it was announced that we would 'change agents' over there, the biggest importing agencies in Europe dispatched representatives to Mr. Hite. And a hustling British youth, representing no one but himself, got the agency almost only because he beat the others to it! 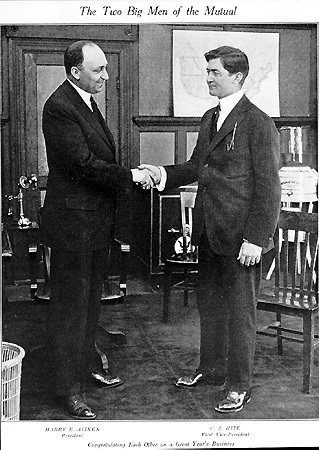 He got the promise of the agency from Mr. Hite at the Pennsylvania Station, New York City, two minutes before the leaving time of a train that was taking Mr. Hite on a quick visit to his parents in Lancaster, Ohio; and when Mr. Hite got back he mailed the contract to London, where the young and hustling Mr. Kimberley started to accumulate a fortune. "Outside of his belief in speed, he had other firm faiths. Chief was that in a clean life, which he thought everyone should live. He neither drank nor smoked, and while a thorough mixer and extremely good fellow, he was never known in life to have told a two-edged story, and he carried his cleanliness right into his business. Among C.J. Hite's business beliefs was that an employee was worth treating right. Perhaps that is why every visitor to the studio thought us a 'happy family.' He wanted you to feel that you had a life job if you cared to stay with him. That's why you seldom read of Thanhouser changes. I do not remember him dismissing a single man of all our vast force. And he personally righted every grievance that an employee presented to him. They actually loved this man at the Thanhouser studio, from temperamental little ingenue to hard, grimy property man. He represented fairness to all of them. "Unfavorable criticism of his product in the press hurt him more than most people thought. He was wounded by criticism of our pictures right after the Thanhouser fire, at a time when he thought reviewers should have been lenient. And I never saw a big man who was so sincerely thankful for the smallest paragraph of praise. When the trade papers spoke nicely of us, which I am glad to say was most of the time, he would show the notice to all his intimates with a good deal of pride. It will be remembered that he engaged one young woman, Miss Billington, for the Los Angeles studio because Mr. Harrison of the World, in a review, said that she stood out in the small part in Carmen. That must show what he thought of a good notice! "Mr. Hite was the best man to his family I have ever seen. They were ever in his thoughts. He would bring his little daughter, Marjorie, to his office on his busiest days, if it was her wish to be with him. He aided his own brothers in every way possible. Of his brother Claude, now in the film exchange business, we prophesied a great future as an exchange man and was always glad that he had introduced him to the business. By the way, high up on his list of exchange managers were R.C. Seery and J.R. Freuler.... Who had been Mr. Hite's closest confidants? I think Dr. Wilbert Shallenberger, his Thanhouser partner; Lloyd F. Lonergan, his producing chief, and Mr. Aitken. A.E. Jones, a man of whom the film world has heard very little, but who has been active in the business end of The Million Dollar Mystery was also unusually close to Mr. Hite, as were A.P. DeSormeaux, also of the Mystery, and Paul Davis, a young Chicagoan, not in the film business, than whom he held no man in higher regard. "It seems hardly necessary to mention in this connection such men as Mr. McIlhinney and Mr. Livingston, with whom, of course he was in constant touch. Of his associates, he had known Dr. Shallenberger the longest, by quite a margin; as young men they had taught school together in the Middle West. This must kill the oft-published yarn about Mr. Hite, overworked in his Chicago exchange, going to see a strange doctor (Shallenberger), for treatment and receiving instead a check - to invest in any old way! Of course, the story was inspired in the faith that men had in C.J. Hite. Merely to look him in the eye was to ever after confide in him, implicitly and absolutely." In the same vein was this article in The New York Dramatic Mirror, September 16, 1914: "In a meeting of the Board of Directors of the New York Motion Picture Corporation held on September 10, 1914, the following statement was directed to be spread upon the minutes: The directors of the New York Motion Picture Corporation have heard with deep sorrow of the death of their associate, Charles J. Hite, a man of strong purpose and broad outlook, with whom the appreciation of a problem meant its solution, eager for new opportunities and quick to seize them when they came, always a true and loyal friend, and fair and just in every relationship. The loss of his counsel will be long and deeply felt, and his memory will go with us through life as that of an upright, able, vigorous, and kindly man."